Where should your Muhlenberg finals study spot be? Do you have mainly tests or papers for your finals? Be honest, when are you starting your study/paper writing process? How often do you usually take breaks in between your work? What type of seating arrangement do you prefer when studying? What is your most efficient way of studying? 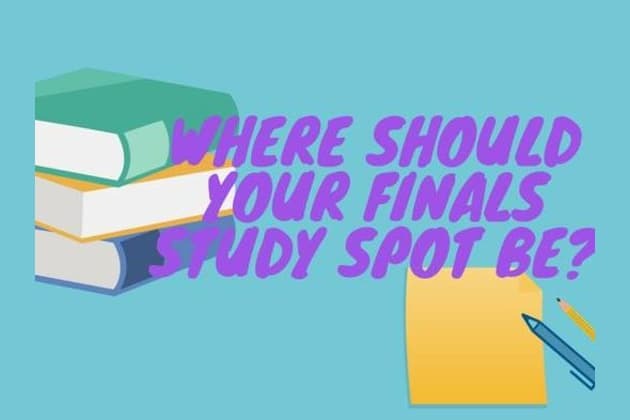 You should study for finals in your dorm room! When it comes to studying, you value comfort. You want to be in your pajamas, lying in bed, so that at any given time, you can take a nap in between study breaks. You also have limited distractions here, so you can definitely stay focused. You should study for finals in the dining hall! You know you need fuel to keep you working, so you are free to get as much food (and coffee or tea) as you want to get you through all those textbook readings. This is also the perfect place to go if you want to do a group study session. You should study for finals in GQ! You like the comfortable seating options, and the fact that it is open extra late during finals season. You can also grab a delicious quesadilla from the grill, or some sushi, and use food as motivation to get through the studying. You should study for finals in the library! You need to be focused when you study, therefore, having a quiet place is extremely important. This is also the perfect study space because you have access to all the most important resources, and three levels that give you plenty of space and variety. Muhlenberg is filled with many locations that are perfect for doing work. Which one should you use to study for finals? Take this quiz and find out; after all, you are most likely procrastinating anyway.